Our abrasive cloth shop rolls have many uses around the workshop or production plant. The material is an X weight cloth. 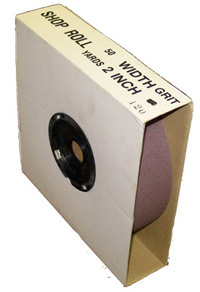 Each roll is 50 yds long, and an abrasive strip can be easily torn off the roll. A strip can also be torn in the long direction so you can make a very narrow strip for sanding hard to reach places. The rolls can be mounted on dowels or similar spindles for easy dispensing.